Personal hygiene is as important as we pay attention to other stuffs. No woman would like to smell bad or have any virginal infections. For that proper cleanliness is extremely important. 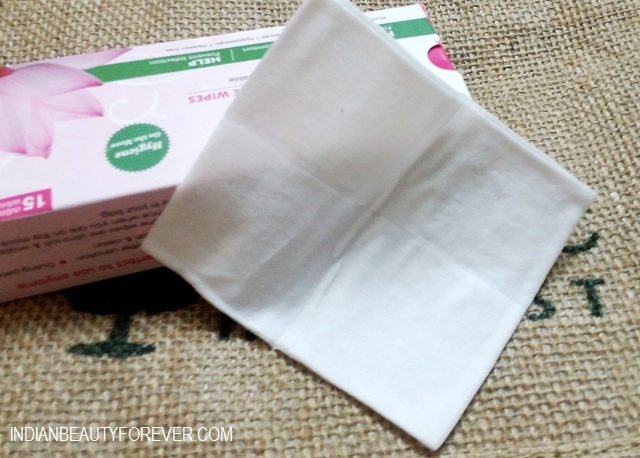 I will talk about these Everteen natural intimate hygiene wipes in this post. 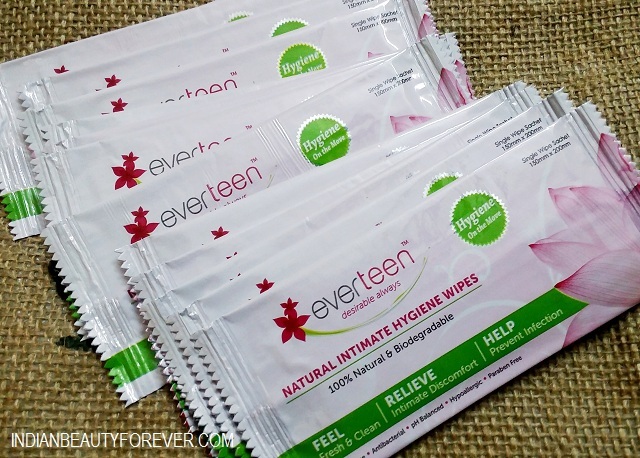 Everteen also makes Intimate wash and these wipes are more like a quick way to get clean and freshen up the intimate area without having to use the water more like while we are out of home or traveling. Price of Everteen natural intimate hygiene wipes: The pack costs 99 rupees for 15 wipes. 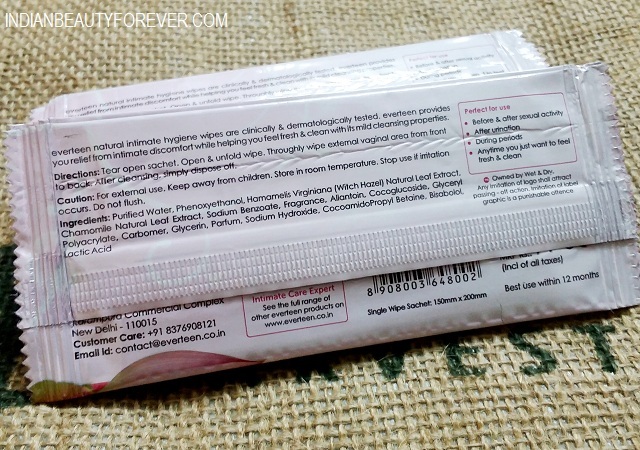 About the Product: India’s First Individually Wrapped Natural Intimate Wipes. Do you know that intimate discomfort can be caused by many factors like perspiration, tight clothing, soap/shampoo or menstruation? Presenting everteen natural intimate hygiene wipes which are clinically & dermatologically tested. everteen natural intimate hygiene wipes provides you relief from intimate discomfort while helping you feel fresh & clean with its mild cleansing properties. Every wipe is ultra-soft which is made of 100% natural & biodegradable cloth. The key ingredients used in the liquid are derived from natural plant extracts. Mild formula of everteen natural intimate hygiene wipes is entirely free from alcohol, SLS & parabens. Everteen natural intimate hygiene wipes are ultra-soft and wrapped individually for your convenience when you are on the move. Now there is no need to carry those bulky packs when you can carry two or three or as many everteen natural intimate hygiene wipes in your hand bag as you would need for a day. Everteen natural intimate hygiene wipes are best for you if you are a fitness freak sweating out in Gym, love playing tennis, badminton or any other sports or a working woman. Everteen help you maintain your intimate hygiene all the time ON THE MOVE. Before & after sexual activity. Anytime you just want to feel fresh & clean. These wipes come in a carton and inside every wipe is enclosed in a sachet. These Everteen natural intimate hygiene wipes are very similar as that of the facial or makeup removing wipes that we use. Therefore using these is extremely easy. You can take couple of them with you in the bag instead of carrying the entire box. I keep the box at home and few in my bag. These wipes can be used whenever you would like to clean yourself down there like after urination, during period and other activities. These wipes smell very refreshing and are moist enough to wipe the area thoroughly without causing any itching, burning, rashes etc. They are pH neutral/balanced and contains no alcohol, parabens. These wipes are also extremely beneficial in curing that occasional itching and discomfort that one may feel during that time of the month.Yes, we all go though that once in a while. These can be used by every girl and women as intimate hygiene is as important as the rest of the body rather even more than that. When the wipe is used you can feel a little extra wet but that wetness goes off after couple of minutes leaving a fresh feel. The wipe size is good enough as to clean the area once thoroughly. The carton and the individual sachet packaging makes them very handy and can be carried few in the bag. There can be slight burning very slight for few seconds sometimes. 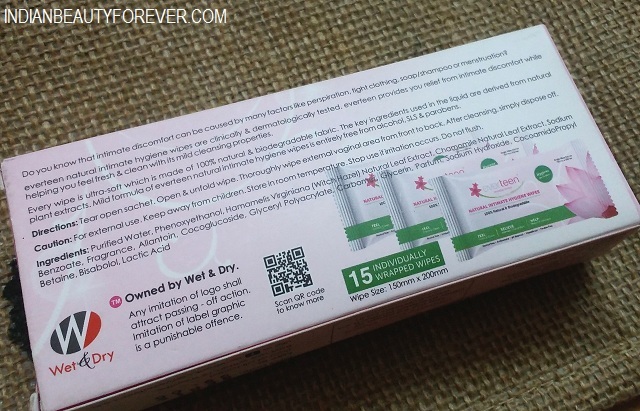 Everteen natural intimate hygiene wipes are very travel friendly and handy to use. These have very subtle scent to them and are alcohol free and paraben free. The anti bacterial and pH balanced formula will keep the intimate area fresh and also prevents itching and discomfort. I will recommend this to every woman who would like to use intimates wipes. PR sample though views are honest as always! !